We’re days away from completing the first semester. Just one more push! Please call Mrs. Kimble at (818) 949-5540, not the Attendance Office, if your child is ill and unable to take a scheduled exam. Note to 7th grade parents: All semester exams for 7th graders will be in the gym from 9:00 am to 10:30 am. Please do not pick up your 7th grader before 11:00 am, as we keep the students in the gym to reduce distractions for the other students still taking exams. The Writing exam will be on Thursday, December 13, and the Literature exam will be on Friday, December 14. Thank you to the many families who have generously supported the Annual Fund. If you have not yet participated and wish to take advantage of the tax benefits of a year-end donation, please mail your gift by December 31, visit our online donation page or contact Donna Merchant at (818) 949-5525. The Admissions Open House was a huge success, with overflow crowds of enthusiastic families. This was the first Open House to welcome visiting families to our new atrium outside of the Norris Auditorium, and all agreed the new space is a game changer! Thank you to all of the students and parents who spent time with visitors and helped make the day a success. Applications to both 7th and 9th grade are up compared to this date last year, particularly among male applicants. Please remind any of your friends who are applying that the deadline is January 11. If you will be applying for financial aid for the 2019-20 school year at Prep, we will be using the ISM FAST online application. The deadline is January 28, 2019, and copies of tax returns will be due February 8, 2019. Find detailed information here. Thank you to the junior class parents for their attendance and amazing generosity at the Junior Parent Dinner. A big thank you to the junior class for all their thoughtful donations; it was a huge success! We are grateful to everyone for their support of the Class of 2020! Read more about it here. December 23 is going to be quite a day for Rebel alumni! We have three events on campus: Alumni Sports Day; the 5th annual Graduates of the Last Decade Career Networking Mixer; and the Five- and 10-Year Reunions for the Classes of 2008 and 2013. 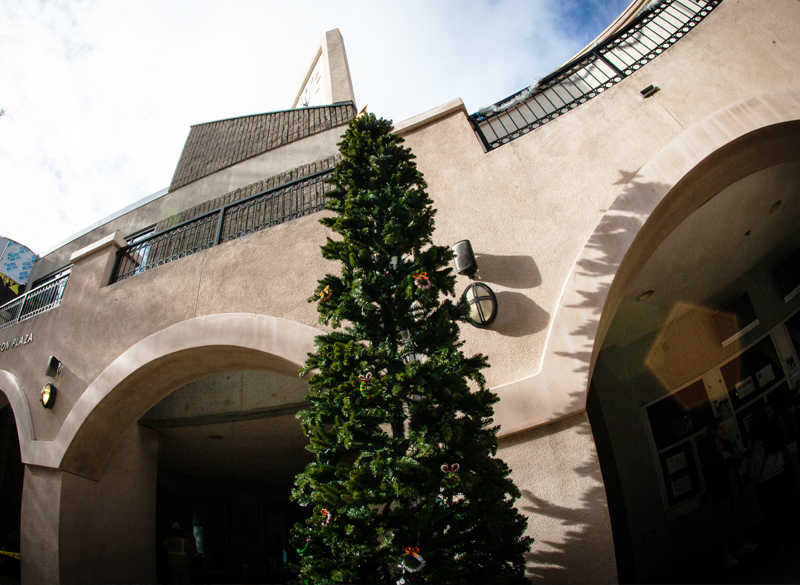 Off campus, all alumni are invited to the annual Alumni Holiday Party in Old Town Pasadena at Ix Tapa. Additional details can be viewed here. Flintridge Prep's annual STEAM & Service Fair will include traditional science fair projects, community impact and service projects, robotics, engineering, art and more. The fair will be held January 31, 2019. Wrapping up the fall sports, the boys and girls cross country programs continue to excel, placing 2nd in CIF. The girls earned another podium 3rd place at the State meet, and the boys were 6th. In winter sports, the boys basketball team (5-4) has wins over local public schools Duarte, Rosemead, San Marino and South Pasadena. Girls basketball (5-1) is undefeated in league and ranked number 6 in CIF. Boys soccer is undefeated 5-0-0, while the girls are 3-0-1 and ranked number 2 in CIF. Girls water polo is 6-3, and 4-0 in Prep League play. Come out and support the Rebels! The ACL raised over $660 during its two weeks of Penny Wars competition between the class grades in November, with middle school winning the competition. Money raised will go towards the Professional Child Development Associates (PCDA) to support children and families with learning supplies. On Friday, December 7, ACL brought snow to campus for everyone to soak up some holiday spirit and get ready for midterms. The student body and faculty all enjoyed the sledding during both lunches. On December 19, ACL will drop off nearly 100 gifts for the children of the Boys and Girls Club on Fair Oaks. This will bring closure for the 2018 year until we return back to school in 2019. Happy Holidays from the ACL, and to all thank you for all your support in helping others! The ACL invites everyone in the Prep community to be a part of the initiatives throughout the year. If you are interested in supporting or volunteering, please contact Alex Rivera, Director of Athletic Initiatives, at (818) 949-5564. ACL news, events, updates and photos can be found here. Seniors will be receiving admission decisions for the early round beginning the week of December 10. We encourage students not to post decisions on social media and to check admission decisions at home. These decisions are personal, and we’d like to remind seniors to be supportive and kind to one another. College counseling class has ended for seniors; however, students may schedule a meeting with their counselor any time. We do not teach this class for seniors in the spring semester. Counselors have begun editing essays for upcoming application deadlines and will return edits by Wednesday, December 19 before the holiday break. Juniors have received a packet of information in the mail launching the college process. Included students will find login codes for Naviance, which will give them access to the summer internship database. By logging in to Naviance, interested students may begin to search for summer programs, some of which have January application deadlines. Students with questions about summer programs may contact Ms. Ventura. Counselor Assignments: We are in the process of assigning juniors to a college counselor. This a thoughtful process, which includes input from Mrs. Kimble and Ms. Canton. We will post counselor assignments outside the college counseling office door on Monday, January 7. Testing for sophomore and junior families: The college counseling office recommends taking the SAT in March 2019 or the ACT in April 2019. The College Counseling office, along with Compass Education group, is hosting a College Testing Night on Thursday, December 13 to inform parents and students of the differences between the ACT and SAT exams. If you have questions about the evening or if you are unable to attend, contact the college counseling office at (818) 949-5510. Sophomores: College Night for sophomores and their parents will be held Monday, January 14 at 7:00 pm in Norris Auditorium. We will welcome a panel of speakers who will highlight the ways in which the college process serves as a foundation for a student’s human development. The keynote speaker for the event will be Maria Furtado, Executive Director of Colleges That Change Lives, a non-profit organization dedicated to the advancement and support of a student-centered college search process. Joining her will be Dr. Kimberly Prater, psychiatrist and founder of Psychology Resource Consultants, specializing in teen patients. The Fathers Club is busy preparing for next semester and beyond. One key initiative is expanding our internship program. On Alumni Day, December 23, we are meeting with the GOLD (Graduates of the Last Decade) alumni to network and discuss opportunities for internships within the Prep community. Stayed tuned for more information about our next Fathers Club Event at the Los Angeles Football Club! All juniors will go to a place of business on May 16, 2019, for Junior Internship Day. If you have a fascinating career to introduce to students, please email Co-Director of Alumni Relations Colleen Bissner or call at (818) 949-5523. Thanks to our hospitality chairs, Annette Starks and Millie Paredes, and their parent volunteers, who decorated Prep’s living room and made it a warm, festive place to ring in the holidays. Thank you to Peter Bachmann for his November 15 Speaker Series presentation, in which he shared his intellectual examination of the ways adolescents develop resilience and flourish. For more information about his talk, please click here. We hope you will join us on March 2, 2019, when we will host Prep’s bi-annual benefit, Flintridge Flashback: A Pretty in Pink Prom, at the beautiful Vibiana in DTLA. Check your mail early in the new year for a special invitation. All proceeds raised will fund the new three-story Collaboration Building on the north side of Prep’s campus. It’s not too late to become a patron sponsor or donate an item to the silent or live auction. If you have any questions, please contact Benefit Co-Chair Monique Stevens at 323-821-2016 or moniquemoret@att.net. Congratulations to the instrumental and dance programs for two incredible concerts! Audiences experienced many great performances by our students, and we salute their efforts in putting together inspiring and fun-filled evenings. You are invited to the Flintridge Singers Holiday Coffee House this upcoming Saturday, December 15, at two different times: 5:00 pm and 7:00 pm in the Miller Theater. We hope to see you there! The Speech & Debate team has making the school proud! Several Rebels competed in the High School Fall Debate Tournament Nov. 16 and 17. They did a fabulous job, bringing home 2nd place in the division. Four debaters won legs to State, including Rithik Jain ’19, Jay Dadwal ’20, Ashwin Sivakumar ’22 and Ian Hunte ’22. The High School Varsity Speech Tournament on Dec. 8 went equally well, and the team brought home 3rd place overall. Rithik won two more legs to State, one for Original Oratory and one for International Extemporaneous. And lastly, on the middle school side, there were nine finishers in the top 10 at the SCJFL Tournament on Nov. 30. There are too many successes to list here, so stay posted for more Speech & Debate updates throughout the school year!